Posts will be less frequent during the general election period: https://www.alberta.ca/election. For assistance, please call 310-0000. Pending safe conditions, Agriculture and Forestry staff will be conducting a hazard reduction burn on Wednesday, April 17th. 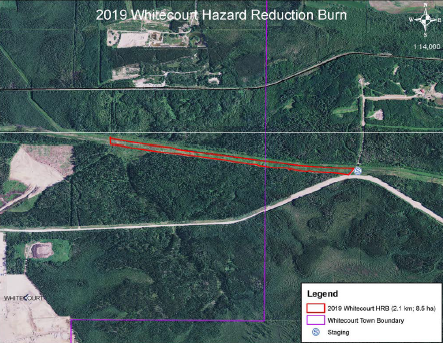 This burn will be approximately 8.5 hectares in size and is located 1.1 kilometres east of the Town of Whitecourt. In preparation for this burn, municipal and provincial firefighters have planned extensively to ensure public safety. Burning will only begin when conditions are within the established burning window. Firefighters will manage the burn until it's fully extinguished. Hazard reduction burns will help remove any high-risk grassy areas near communities where the risk of wildfire may exist. Do your part to prevent unwanted wildfires by using extra caution in areas of dry grass. 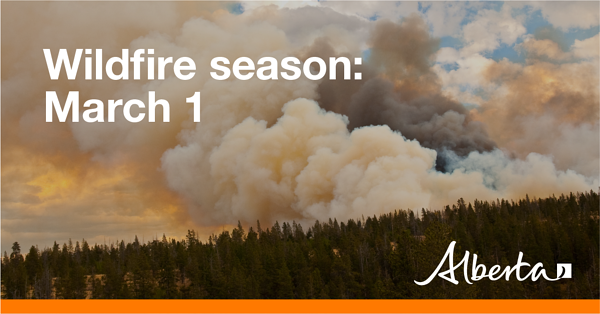 For more information, visit wildfire.alberta.ca. As of March 1, all winter burn sites must be completely extinguished. A free fire permit is now required for any burning (except campfires) in the Forest Protection Area of Alberta. To get your free permit in the Whitecourt Forest Area, call 780-778-7166. Alberta Wildfire App for Apple or Android devices. Alberta Fire Bans App for Apple or Android.